Viva Safaris invites you to join this amazing trip to explore the wonderful wildlife in South Africa. During this holiday, you will join game drives and widen your knowledge by watching animals and their habitats for the whole day. Staying overnight at a lodge will make you feel closer to nature and dive deep into the fresh air and the environment fulfilled with nocturnal sounds. Group size: The maximum numbers of participants is 9 persons. During this trip, you will stay one night at Tremisana Game Lodge and four nights at Marc's Treehouse Lodge. Tremisana is the largest and leading lodge in this section having a total of 15 chalets plus a two-bedroomed guesthouse. It can accommodate a maximum of 40 guests. Each room of the lodge has en-suite shower, toilet, and basin. All units are air-conditioned. The lodge is serviced by two excellent boreholes. Its proximity to the tar road means Tremisana is easily accessible all year round, including the rainy season. The presence of lions, elephant, and buffalo necessitates an electric fence around the camp. Perhaps the most striking feature of Tremisana game lodge is the beautiful gardens. The presence of numerous bougainvilleas, various palms, cycads gives the camp a subtropical feel. Water features add a soothing effect, making the overall feel of Tremisana very relaxing. At night, the subdued light from the illuminated paved walkways lends a romantic and magical ambiance to the camp. After being picked up from your home, hotel, hostel, or O.R.Tambo International Airport (JNB), you will drive to Tremisana Game Lodge where you have time to have a swim or quick rest in your air-conditioned chalet. You will board the open Landcruiser for an exciting sunset drive. After the dark, you will use spotlights to locate nocturnal animals. Dinner will be an unforgettable bush braai deep in the African bush. After the dinner, you will continue with the night drive and overnight in an en suite air-conditioned chalet. In the early morning, you will depart for the Olifants River where your armed ranger will conduct an exciting four-hour walk in the wild. You will enjoy this prolonged opportunity to discover savor the Bushveld’s secrets on foot. You will get a fantastic opportunity to track Africa’s big animals and approach close enough to take a good photo. You will return to Tremisana for brunch. After the high tea, you will board the open Landcruiser for a two-hour game drive. Dinner and overnight will be at Marc’s Treehouse Lodge. You will drive to Orpen in Kruger where you transfer to an open game viewer. Your guide will show you the varied fauna and flora of this magnificent wildlife paradise. You will enjoy a full day of bird-watching and game-viewing. Then, you will transfer to Marc’s Treehouse Lodge for dinner and overnight. After your breakfast, you will drive to Moholoholo Rehabilitation Center for orphaned and injured animals. You will get an opportunity to get up close and personal to lions, leopards, cheetahs, and hyenas. Sunset game drive at Motlala Game Reserve. 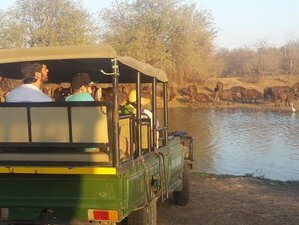 Day 5: Kruger National Park %You will enjoy another full day of game viewing in the Kruger National Park. The early morning game walk with an armed guard to explore the many animals that inhabit Marc’s Treehouse Lodge is for you. After your breakfast, you will travel to the Three Rondawels of the Blyde River Canyon. Viva Safaris will return you to your home, hotel, hostel, or O.R.Tambo International Airport (JNB) at around 5:00 p.m.
During this trip, you will join a three-hour sunset drive on Balule Big Five reserve, a big five bush walk with armed rangers, two full days in Kruger Park, a visit to Moholoholo Wildlife Rehabilitation Center, take part in Tshukudu Big Five Game Reserve drive, and enjoy a morning walk at Marc’s Camp with armed rangers. The safari will take place in Kruger National Park, South Africa. Kruger National Park where nearly two million hectares of an unrivaled diversity of life forms fuses with historical and archaeological sights is a symbol of the real Africa. The world-renowned Kruger National Park offers a wildlife experience that ranks with the best in Africa. Kruger National Park is one of the largest game reserves in Africa, covering an area of approximately 20,000 square kilometers. Daily breakfast and dinner are included. Please book your flight to arrive at O.R.Tambo International Airport (JNB). Transfer from and to the airport is included. Viva Safaris will pick you up from the airport.